Watching an episode of Bagpuss recently, I liked the crude embroidered owl pictures in one of the stories, so emulated the style in a linoprint. I took the opportunity to print up some extra previous linocuts to make I to cards! Magic Horses – Cards for Christmas! As all BLAC artwork is personal, the latest addition to our linocuts is, as usual no exception, although presented here as cards this time instead of mounted prints! You can buy either a single card or in packs of three from our shop here. Upon moving to the house I live in now, a few years ago, my son was just starting school and I was keen to make the walk to school with him a special and magical thing that we could share, with some key landmarks we could discuss along the way. One of these was a set of gates near us, clearly made bespoke for the house, with a beautiful design of a horse made out of the wrought iron. I loved the design, and thought it had somewhat of a fairytale quality to it, and these gates became known to me and my son as the “magic horse gates”, which we still pass twice most weekdays. I was sure I would attempt some kind of drawing or artwork based on these at some point, so took some photos at the time. Now, 3 years later, I have finally got around to making a print of them – I especially find the shape of the tail and the mane pleasing as they suggest movement and passion. Because these horses have some kind of mythical, magical quality, they seemed peculiarly fitting for Christmas cards, so I tried making cards with a Christmas message below them. e card for £2.50, or a variety pack of 3 for £6.00 from our shop here– P&P is FREE in the UK! We’re proud to annouce that a selection of our prints are currently on display at The Holt cafe, Sheffield (on Arundel Street), they do some jolly lovely food and cakes in a unique setting with vintage and reclaimed furniture, so why not have a coffee and a peruse if you’re passing? Our prints are for sale, but hurry, they’ve already sold the first one! As all BLAC artwork is personal, the latest addition to our linocuts is no exception, and “Daisies for Ruth” is more personal than most – Missy tells the story here! “Daisies for Ruth”was created by me as a personal and specific thank you for my new sister-in-law, who had spent many months working on a very beautiful and creative piece of knitting – a shawl that was part of my wedding outfit. We had wheat stooks and corn dollies instead of flowers at our wedding, so it was perfect when Ruth suggested a wheat pattern in the knitting – so delicate and made from beautiful soft Alpaca yarn (or silk I think!). There are also tiny bead details in the shawl, with a 30s style sunburst pattern in the centre, which perfectly matched the style (and colour) of my wedding dress. My wedding outfit nicely combined all the important women in my life – I designed and made my own dress. My mum helped with it and bought the fabric, my mother-in-law gave me the clasps that I sewed onto my dress as detail and the vintage bag I used, and matched the dress fabric to (which my mum also mended bead detail on). My sister-in-law made the beautiful shawl, my best woman and friend Lizzie also helped with the dress and made a garter also using my wedding dress fabric, and the earrings I wore belonged to my late grandmother. It feels nice that all these amazing and inspiring women played a key part in something that felt so personal and important to me. So much time and work had clearly gone into the shawl, perhaps 6 months in fact, that I wanted to make something personal for Ruth also – I thought something home made; that a linocut would be nice and discussing ideas for it on our honeymoon, Paul told me daisies were her favourite flower. I took a number of photos in Devon during our honeymoon (not far from where my husband’s family had holidayed when he was young) and used these as a guide to create the final linocut from. I like the simplicity of this, yet it weighs heavy with all of the above personal significance.The linoprint pictured is a test print only; Ruth owns the first proper and only current print of this, but I would consider making future unique copies by special request. 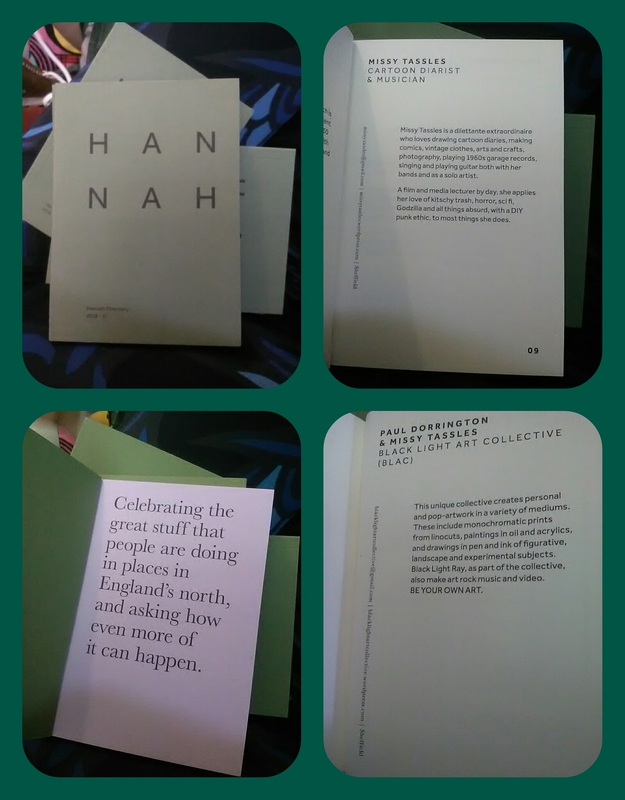 BLAC are proud to be once again included in this years Hannah Directory. Named after Hannah Mitchell, suffragette and rebel, the directory is a yearly print publication celebrating the great stuff that people are doing in the North of England, and asking how even more of it can happen! Black Light Ray Live and fully animated! BLAC chosen as “one of the best examples of enterprising spirit”! BLAC still busy into 2015 with new prints and old! December print of the month – in time for Christmas! BLAC prints at Greenscapes Nursery gift fair!